HART Design & Manufacturing has been making superior quality cheese processing and packaging equipment since 1975. The company was formed by two food packaging engineers, Gilbert Hannon and Gerald Schaetz. Through their vision, we have become a global leader in the design and construction of standard, specialty and proprietary stainless steel equipment for use in the food and dairy industry. Both Gil and Gerry got their start in food machinery when they worked as design engineers at FMC Packaging Machinery Division. Gil later became president of Green Bay Machinery, a subsidiary of Schreiber Foods, Inc. Gerry worked as plant engineer at Schreiber, and later became project manager for Green Bay Machinery. Immediately after the company purchase, Gil left Green Bay Machinery to manage the new corporation, which was soon renamed HART Design & Mfg., Inc. Gil worked out of an office building at 505 Henry Street, Green Bay, and commuted to Winneconne as required. Because of the strong engineering background that Gil and Gerry had in designing food machinery, it was quite natural for HART Design to begin development of equipment for cutting, handling, processing, and packaging cheese. In November 1979, Gil and Gerry purchased the assets of Air Conditioning & Heating Specialists Inc., which primarily consisted of the “Climate-Tel” line of air conditioners and “Environmental Filtration Systems,” a filter sales division. In January 1980, Gerry left Green Bay Machinery to manage the operations of these new acquisitions from Air Conditioning & Heating Specialists Inc. In 1981, a new 4,000 square foot manufacturing facility was constructed at HART’s present location on Radisson Street in Green Bay. The entire Winneconne operation was then relocated to Green Bay. By this time HART had started the development of cheese cutting and handling equipment. The company also had undertaken several rebuild projects for both FMC-style wrapping machines, Hayssen 43L and 5000 style machines. These machines were converted for packaging 3 lbs. and 5 lbs. loaves of sliced process cheese. 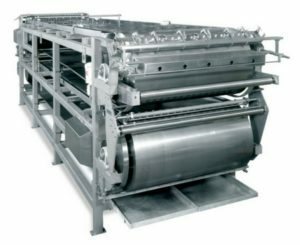 In 1982, HART completed the design for its first major piece of equipment, an all-new HART 3 x 12 Wrapper to replace the Hayssen 43L and 5000 style machines. The only competition was located in Europe, since both Hayssen and Battlecreek discontinued their models. HART sold two in 1983 and one in 1984. This machine has remained one of the company’s most important products. In early 1984, the design was started for a new all stainless steel filler for 1-, 2- and 5-pound loaves of processed cheese. In August of that year, an agreement was reached with American Can Company to purchase the assets of their machinery division. The primary line of equipment was the “Auto Pouch-Auto Pour” line, and Automatic Filler. The new HART 125 Filler already served as an integral part in this new line. This purchase also included an old but reliable eight-ounce cream cheese line. Since then, HART redesigned and improved the two lines of equipment to make HART the leading manufacturer for this type of cheese filling equipment. Late in 1985, HART expanded its shop building from 4,000 square feet to 7,000 square feet and added an additional 5,300 square feet of storage space. In addition, a 4,000 square foot office was constructed adjacent to the shop building. This allowed the company to consolidate all of the operations from various rented buildings into one facility. Gil Hannon retired in July of 1987, but he continued to be an integral part of the organization until his passing on March 20, 2002. Gerald Schaetz, remained chairman of the board until his death on April 6, 2008. Other building additions were made to the manufacturing office and warehouse space in 1989, 1990, 1991 and 1993. Operations now encompass more than 40,000 square feet with over 35 craftsmen. HART added a complete casting line and cutoff and a line of 640 lbs. cutters, clamps and special cutters to further enhance our product line. The company also added several other pieces of equipment, such as IWS feeders, stackers, and natural cheese cutting and handling equipment. Hart Design & Manufacturing purchases H&CS. This acquisition allowed Robotics and Product Handling to be incorporated into HART’s lines, giving the capabilities to build complete cradle to grave product lines. Timm Schaetz (Gerry’s son) becomes president of Hart Design & Manufacturing. Timm brings his no compromise commitment to quality equipment and customer service. Timm’s dedication cements HART’s place in the dairy processing industry for generations to come. Today, HART is recognized as a leading manufacturer of quality cheese processing and packaging equipment. The HART team continually strives to develop other specialized equipment that will satisfy our customer’s needs.